But under all those layers of fleece, there is still an actual human body. And it needs to move. Easier said than done, we know. We’re not asking for much. Just put on a pair of non-spandex pants (maybe do a little something with your hair while you’re at it) and take yourself to OZ Arts for ink: Camille A. Brown & Dancers and let the music and dance move you. You’ll get your groove on with the sounds of traditional African and handmade instruments creating sounds influenced by Blues, Hip-Hop, Jazz and Swing. The performers perfectly execute choreography inspired by African-American social dance, African, Tap, Jazz, Modern and Hip-Hop. If this mesmerizing combination of sound and movement doesn’t set your body in motion, you really do have Nana’s peanut butter fudge in your veins. But even better than feeling the music, ink expresses something much more than just dance and music. It personifies African American narratives and identities through authentic cultural expression. Camille A. 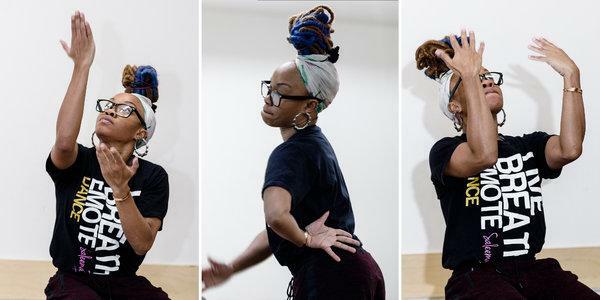 Brown leads her dance company through excavations of ancestral stories, both timeless and traditional, that connect history with contemporary culture. You will not only be inspired by the beauty of the dance, but by the poignant and powerful stories that the dance brings to life. So what are you waiting for? Put the cookies down and GET TICKETS NOW for this inspiring performance!